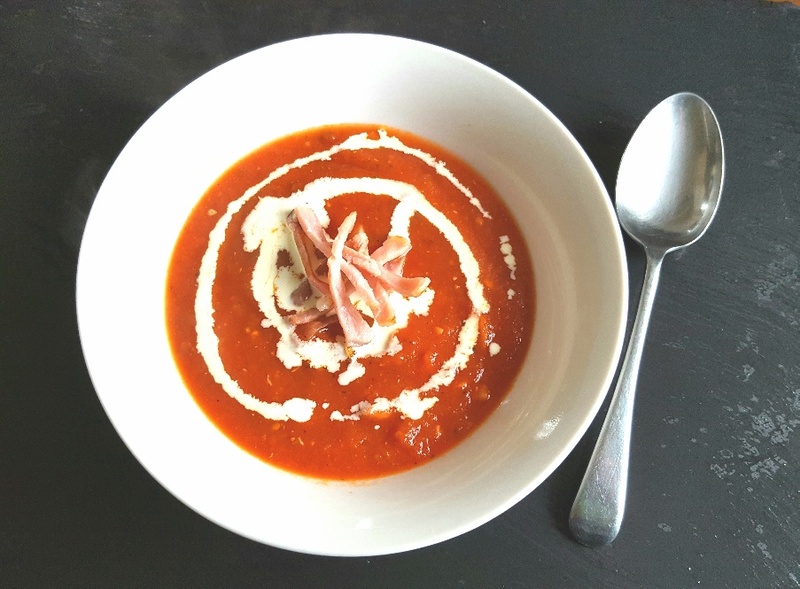 There’s nothing better on a cold day than a steaming hot bowl of soup and this tomato and smoky bacon one is particularly tasty. The recipe came about when I was looking in the fridge for something for lunch one day, spied a few rashers of cold bacon that I’d cooked the day before, realised that I didn’t fancy something cold to eat and decided to whizz it up into a soup instead. I always have tins of good quality chopped tomatoes in my kitchen cupboards because they’re a staple ingredient in a lot of what I cook. I’ll let you into a secret though. For all that you can buy expensive Italian tins of plum and chopped tomatoes in the supermarkets, often for as much as over £1 per tin, the best quality tinned tomatoes I’ve ever had (and they’re the ones I buy every time) are an Indian brand called KTC which Morrisons sell at 3 for £1. The tomatoes they use are always sweet, the tins are never filled with unnecessary excess juice, and the chunks of tomatoes are always perfectly ripe. I also know they’re excellent quality because on recycling day you can see huge 2.5kg empty tins of them waiting to be collected from outside the best Indian restaurants in Stirling. If that’s not a good recommendation, what is? One question I get asked all the time is what low FODMAP stock I use because a lot of the stock cubes which are on the supermarket shelves contain onion and/or garlic. Some people who eat a low FODMAP diet can find that their systems are okay with a small amount of onion and garlic, such as the quantity found in stock cubes. However, others cannot tolerate it in their diets at all. There are a couple of options if you’re very sensitive to onion or garlic though. The first is Massel ‘s Vegetable Stock Cubes which are completely free of onion or garlic. I’ve tried this stock and it’s quite nice and it certainly does the job well. The second option is Casa de Sante’s low FODMAP Vegetable Stock Powder which is my preferred choice because I like the background herbiness it brings to meals. It’s also officially certified by FODMAP Friendly. If you’d like, you can buy either of these options online by clicking on the names of the products. I used my Nutribullet to make my tomato and smoky bacon soup nice and smooth, but you can just leave it chunky if you don’t have one or if you’d prefer to make a heartier soup. Both ways are delicious regardless of the texture you go for. This soup is very simple to make, but it’s got bags of flavour in it. It’s thick, rich, well-flavoured and hearty. It’ll warm you up from the inside out. Cut the fat off the bacon and dry fry it in a large saucepan until it has released its oil and is crispy. In the meantime, cook the bacon rashers. Keep a few rashers aside, but chop up the remaining bacon and add it to the saucepan. If you’re using a Nutribullet then blend the chopped tomatoes and dried herbs until smooth and add them to the pan. Add the vegetable stock. Cook until hot, taste and season with salt and pepper (if necessary) and then serve with a scattering of bacon bits on top of each bowl.